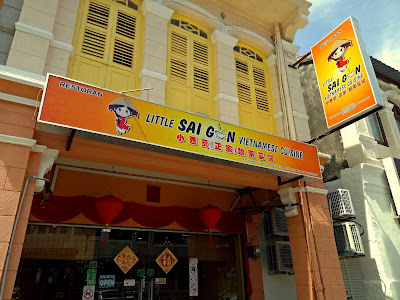 Special thanks to Little Saigon Vietnamese Cuisine for extending this food review invitation. 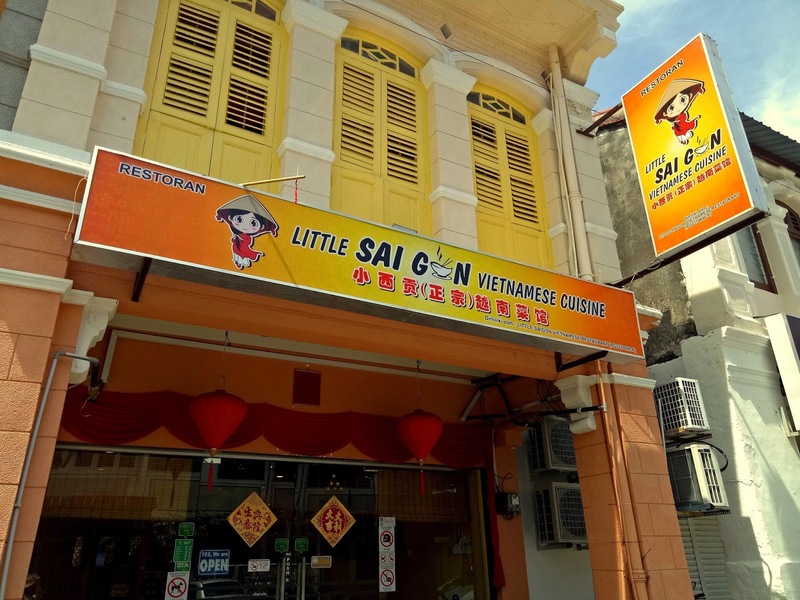 Situated on Lebuh Melaka, Little Saigon Vietnamese Cuisine is somewhat off the beaten path. 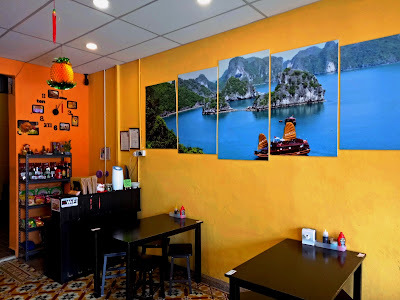 Nevertheless, this Vietnamese restaurant is quite popular among locals. 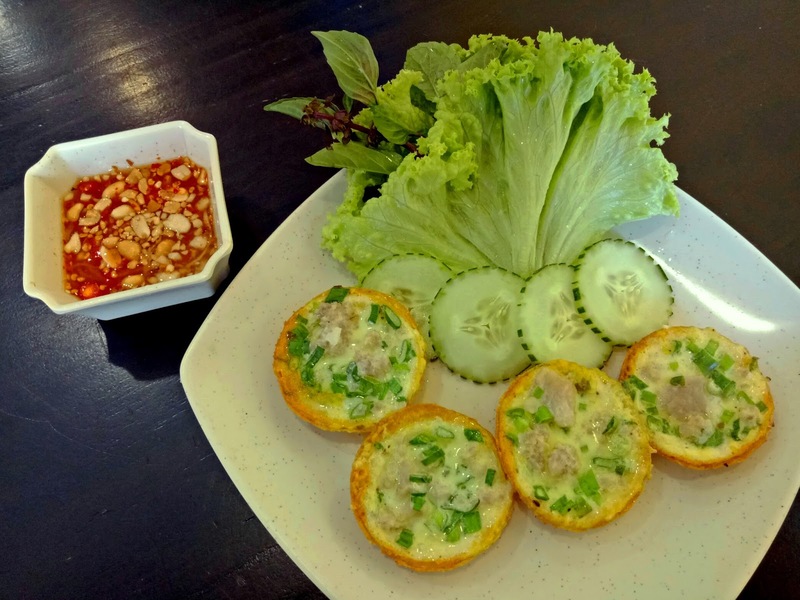 As its name implies, Little Saigon specializes in southern Vietnam dishes. The air-conditioned dining section is reasonably spacious. Hung on its orange walls are photos of famous landmarks in Vietnam. Meanwhile, a small shelf behind the cash register displays Vietnamese merchandise such as coffee, noodles and condiments. Today's lunch begins with an appetizer: Banh Khot (Bánh Khọt, RM9.90 for 4 pieces, RM16.90 for 8 pieces). These fried pancakes are made of rice flour and contain coconut milk and pork. The pancakes are quite soft and fairly sweet. Meanwhile, chili sauce is provided in a separate saucer. 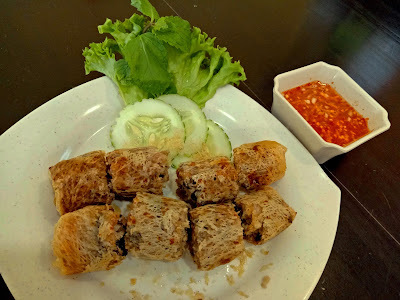 Cha Gio Chien (Chả Giò Chiên, RM12.90) is another appetizer that is popular in southern Vietnam. These spring rolls are filled with taro and minced pork, and rolled in a sheet of rice paper. The rolls are then deep-fried such that the outer coating becomes crispy. Pho Bo Uc (Phở Bò Úc, RM16.90) is one of the most recognizable dishes in Vietnamese cuisine. The broth is prepared by simmering beef bones and various herbs for several days. For customers who do not take beef, chicken and pork versions are available too. 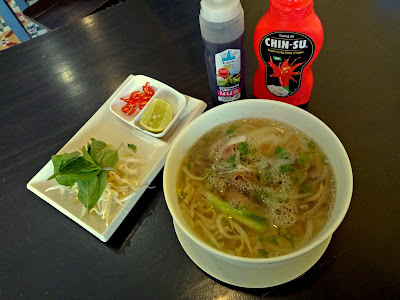 Pho Bo Uc uses a type of flat rice noodle called bánh phở. This dish also contains succulent slices of Australian beef. Thai basil (húng quế) and bean sprouts are served on the side. Condiments include hot sauce (tương ớt), fish sauce (nước mắm), Vietnamese chili peppers and lime. Meanwhile for customers who prefer rice, Little Saigon has a surprisingly large variety of à la carte dishes. 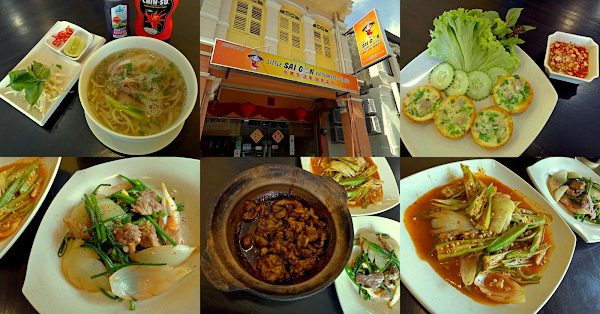 I highly recommend Thit Kho Tieu (Thịt Kho Tiêu, RM13.90). 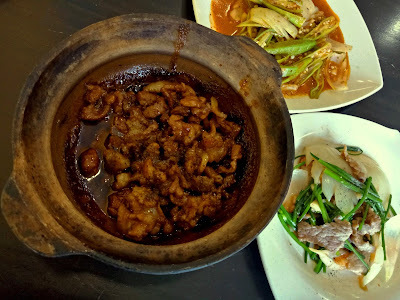 Served in a claypot, tender pieces of pork belly are seasoned with savory pepper sauce. Enjoy this dish while it is still hot; every morsel of pork is tantalizing to the palate! 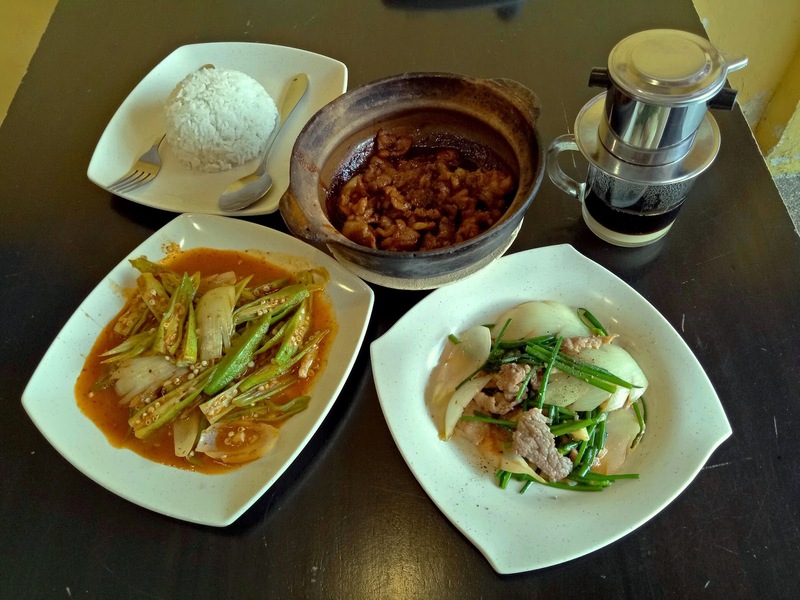 Meanwhile, diners who do take beef may want to try a plate of Bo Xao Bong He (Bò Xào Bông Hẹ, RM15.90). 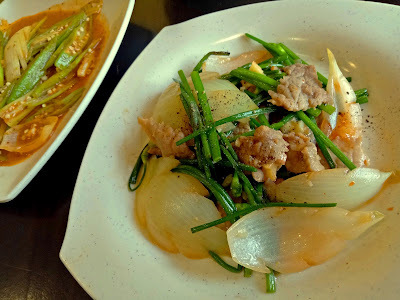 The dish comprises of stir-fried Australian beef with garlic chives and onions. Onions provide much-needed juiciness to balance the strong taste of red meat. 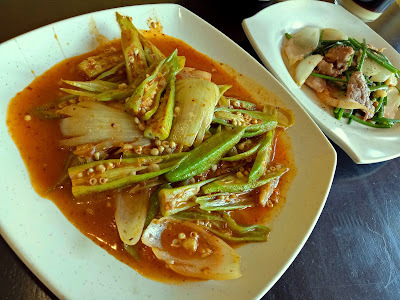 Dau Bap Xao Sate (Đậu Bắp Xào Sa Tế, RM10.90) combines okra (lady's fingers) and onions using sweet satay sauce. This vegetable dish goes better with rice as the sauce is somewhat intense in flavor. 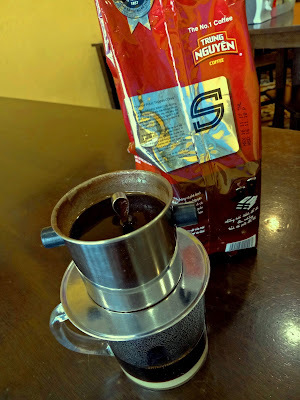 Cafe Sua Nong (Cà Phê Sữa Nóng, RM5.90) is prepared from Vietnamese coffee beans. Dark roast gives the coffee exceptionally bold taste. There is also an iced version of this drink called Cafe Sua Da (Cà Phê Sữa Đá, RM6.90). In either case, the coffee is brewed in a drip filter called "cà phê phin". Hot water is poured over finely-ground coffee and is allowed to seep through for several minutes. Drip by drip, filtered coffee mixes with condensed milk in the cup below. 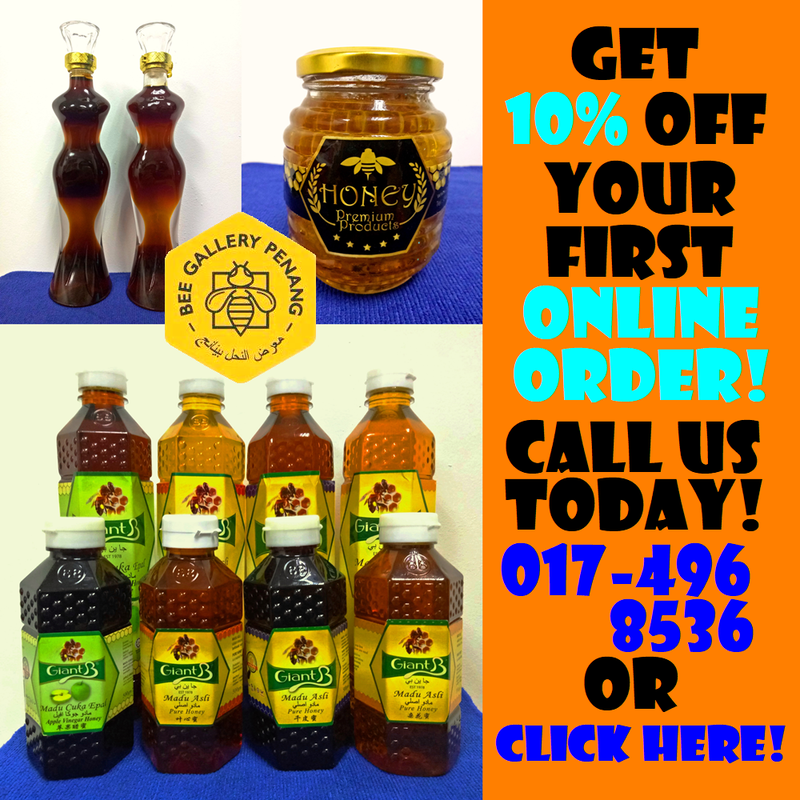 Little Saigon uses condensed milk that is imported from Vietnam because it has richer taste than its Malaysian counterpart. Little Saigon's menu covers a wide range of dishes to cater individual diners as well as families. Vietnamese steamboat is available too but I have yet to try it. 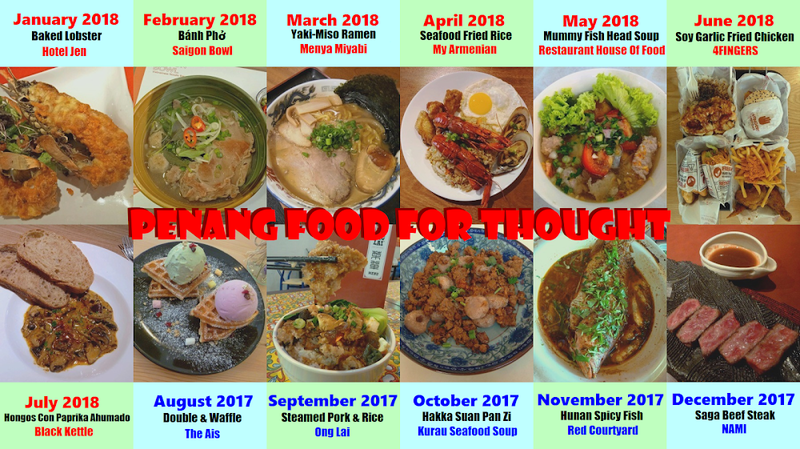 The restaurant's recipes reflect the very basics of homestyle cooking, essentially how a typical Vietnamese family cooks at home. As for pricing, the food here is pretty affordable. Directions: Driving eastbound along Jalan Dato Keramat, turn left to Lebuh Melaka. Little Saigon is approximately 100 meters down the road on the left. Street parking is available along Halaman Melaka.